I downloaded this vector by `Owari because it was so awesome. It took me a while to figure out what I wanted to do with it. But I finally figured it out. So I added these awesome wings brush I downloaded. I added some other brushes and lighting effects, and a very subtle texture that can only bee see at full size. I just wanted to make something simple and elegant. I originally submitted this to AnimePaper.net so it Has my AP sig. overall love the vector ? Wah! It's pretty! Although I agree with YoruAngel-san about the text but It's really pretty! 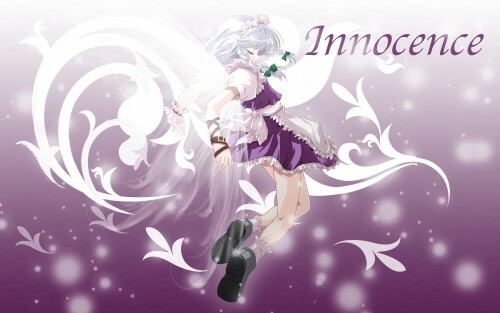 Sakuya looks really innocent and cute in this wall. Good job.